Many people suffer from the dark skin around the mouth or Skin Pigmentation Around The Mouth. The dark skin looks very unflattering and unattractive. The darkness of skin is called Hyperpigmentation which is caused due to the presence of excess Melanin in certain parts of your body. As the skin around our mouth is very sensitive, it is more prone to the effects of the excess production of Melanin. Sun Exposure – Exposure to direct sunlight for a long period of time can be a reason for the darkness around your mouth. Hormones – Hormonal imbalance can also play a major part in the excess production of melanin in your body. Hair Removal Creams – Chemical hair removal creams have an adverse effect on our skins. Not only do they darken our skin but the chemicals in them may severely damage our skin permanently. Anti-wrinkle creams – These creams have ingredients which trigger the production of melanin. 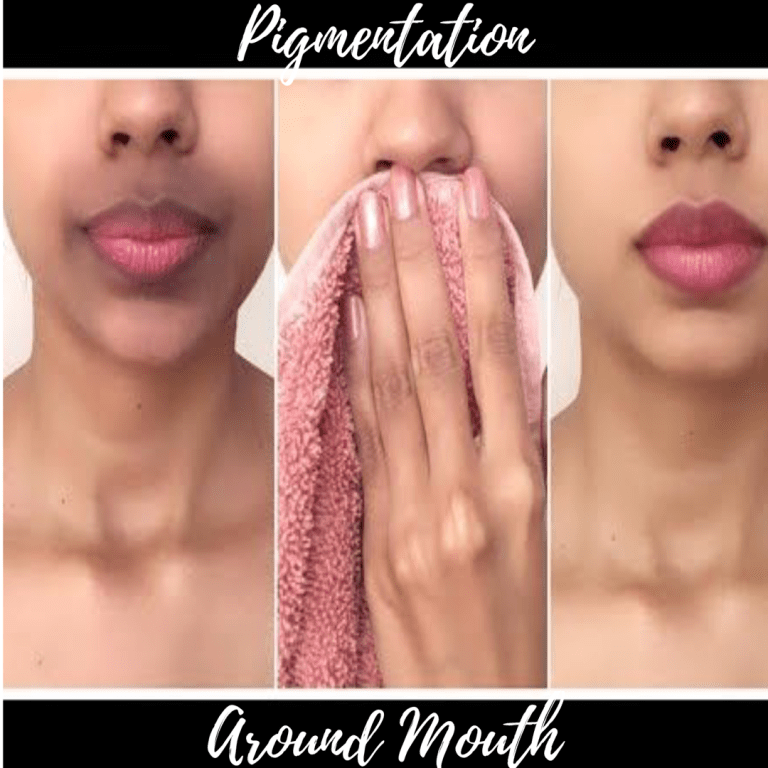 Excessive waxing/threading – Continuous abrasion on the sensitive skin around your mouth can also be a reason for the dark marks around your mouth. Dead skin cells – If you don’t exfoliate your face once a week, there could be build up of dead skin cells around your mouth which causes the darkness and pigmentation. Rather than using makeup and concealers to hide the darkness, one should rely on natural remedies for the best result. Lemon has been used to lighten up the skin for centuries. Using lemon juice to treat hyperpigmentation should be the first step. Lemon can be a little harsh on the skin if applied directly, therefore, mix the lemon juice with water in the proportion 3:1 for best results. Apply this mixture on the affected areas. Do this twice a week for about 2 months to notice results. Mix egg whites from 2 eggs with a little honey for moisturization. Apply this on your face to treat hyperpigmentation. Use a face scrub or a home-made face exfoliator to remove the dead skin from your face. Exfoliating twice a week is very important to maintain healthy skin. Use an orange peel face scrub for best results. Orange, being a citrus fruit, just like lemon, helps in lightening the skin. Aloe Vera is used to soothe and nourish your skin. It helps in lightening the skin around your mouth. You can use the Aloe Vera gels available in the market or extract fresh gel from an aloe leaf easily. Everyone knows that turmeric is used to make your skin glow. It has properties which help in treating various skin problems. Add a few drops of water and make a paste. Apply this paste in a circular motion all over the affected area. Leave it on your skin for 10-15 minutes and rinse with lukewarm water. These remedies should be done regularly for 2-3 months to notice a visible change in your condition. Picking one of the remedies and working on it regularly will help you get rid of hyperpigmentation and give your skin a glow!